Whatever Happened To The NFL Combine's Fastest Man? Rondel Menendez wants to play. It's Sept. 3, 1999, and the Atlanta Falcons are playing their final preseason game, against the Cincinnati Bengals. It's the last opportunity for players on the bubble to earn a place on the roster. Menendez has already done enough to show he's one of Atlanta's 53 best players, but wants to get into the game anyway. "Even though they already knew who they were cutting, I didn't get play time at all, but I kept asking the coach to put me in," Menendez says. "Put me in coach, let me do something, let me show you something else. Put me in. He kept saying no, kept saying no, I kept bugging him, and he let me in, and that's when I got hit on the punt return." Before Menendez can reel in the punt, a Bengal hits him in the knee. An official throws a flag, but the result is far more costly than a penalty. Menendez has a torn meniscus, and because roster spots are so valuable, the Falcons cut him. And so ends the NFL career of maybe the fastest man ever to run at the NFL Combine. Menendez always knew he was fast. He claims that as a ninth grader trying out for the track team at Eastern High School in Louisville, Ky., he was running 40-yard dashes in 4.3 seconds. He admits that those sprints were hand-timed, which created a larger margin of error than today's electronic timing. But while he doesn't boast about it, and there's no arrogance in his tone, he knows just how fast he was. "My brother was running track and playing football, and they already knew that I was fast, because my brother was fast," he says, in a thick Kentucky drawl. "I was always running 4.3 in high school." Granting that he was timed using a less precise technique, Menendez arrived at Eastern Kentucky University out of high school with a 40 time faster than that of the average modern-day NFL wide receiving prospect. Jonas Hill, a former EKU running back and Menendez's roommate for four years, believed that Menendez was the quickest on the squad even as a freshman. "He was the fastest on the team, without a doubt," Hill says. "As a matter of fact, he was the fastest one on the team when he came in as a freshman, so that's saying a lot. One of the first times he actually showed off his speed, when we really, really knew, is actually in the parking lot behind the football dorm." Some players were holding races in an attempt to figure out who was the best. According to Hill, there was one upperclassmen said to be the fastest on the team, and one incoming freshman who was supposed to challenge that title. Menendez beat both of them. And his speed only improved from there. When he first arrived at Eastern Kentucky, Menendez was a lissome 5-foot-8, 150 pounds; once he started training, lifting, and putting on muscle, he was regularly clocking in the 4.2s—and becoming incredibly successful on the field, too. Though he took a medical redshirt in 1994 and only totaled 44 receptions for 821 yards in his first two seasons, he had a stellar junior year. In 1997, Menendez set the school record for most receiving yards with 1,137—on just 54 receptions, at over 21 yards per catch. Against Eastern Illinois, he turned in the second-best single-game receiving performance in EKU history: nine catches, 280 yards, two touchdowns. He followed his breakout junior year with a strong final season, collecting 52 receptions for 1032 yards and 11 touchdowns, along with five rushes for 120 yards. "He was very well respected, not only by his own teammates, but by the other teams," Hill says. "Everybody knew." More people—the right people—would need to know, though, if he was going to raise his draft stock. Despite his quickness, Menendez was still from a small university in Kentucky that few knew or cared about, so little attention came his way when he left college and set his sights on the 1999 NFL Draft. 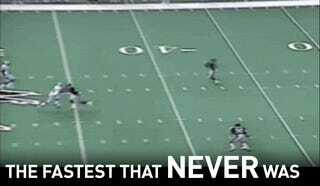 The combine had switched the 40-yard dash that year, from hand-timing to a partial electronic timing system, which measured the end of the run with a laser for more accurate results. It was Menendez's ideal opportunity to make everyone notice his biggest strength. Menendez says that he actually ran his best time, a 4.19, on his first attempt, but because combine officials believed he was wearing track shoes with rubber spikes, he had to run it again. In regular shoes, he ran a 4.24. "Our bodies are our résumé," he explains. The NFL combine is a sort of very specialized job interview, and he'd just aced his. Rondel Menendez holds a record, but he is not unique. Every year, players with similar backgrounds head to the combine to show off their one freakish skill. Maybe they'll bang out an obscene amount of reps on the bench press, like defensive lineman Justin Ernest (also from Eastern Kentucky), who did 51 in 1999. Or they'll show off their intelligence like former Alabama quarterback Greg McElroy, who scored a 43 of 50 on the Wonderlic. Or they'll be full-on workout warriors like defensive end Mike Mamula, who aced every part of the combine by repeatedly practicing the drills, and bumped his stock up to the seventh overall pick in 1995. The thing is that none of these players ever did anything in the NFL. Exercises that don't take place within the context of the game only reveal so much. Understandably self-interested as he may be, though, Menendez has a point when he puts the 40-yard dash in its own category. "In my eyes, I would say, I like to think of the combine like a house," he says. "And you have many structures of a house, and there's many components that take place, be put in place to build a house. But the one main thing that will keep your house secure for a long time is the foundation, and that's where I say the 40 is. The 40 is the foundation because it doesn't matter how smart you are, doesn't matter how strong you are. If you cannot move quickly, that is, if you cannot move quickly in a short period of time, you cannot play the game of football, because everything is with speed." That a guy who's been fast his entire life will insist speed is the most important attribute of a football player isn't surprising. But, Menendez isn't wrong, and the 40-yard dash holds value even for players at positions that don't require much sprinting at all. Linemen, for instance, need to drop down immediately into their blocking stance at the snap of the ball, so as not to be bowled over. Scouts can use the 40 to judge how quickly they can burst from a stopped position. Even mastery of football's most basic tool, though, doesn't guarantee a roster spot. Menendez was drafted in the seventh round, 247th overall by the Falcons, and returned punts in the preseason of his rookie year. "Every time I would get the ball, I would see everything so clearly, you know, and it was so easy just to run past people, because I guess I was so fast," he says. His ability was evident in the first game of the preseason against the Detroit Lions, when he took his second punt return 63 yards for a touchdown. The game recap says he also returned his first punt 32 yards, setting up another touchdown. "I hope I caught somebody's eye tonight," he was quoted as saying. But he never got the opportunity to play in the regular season. His full-speed mentality led to the torn meniscus. Menendez caught on with a few teams after his injury—the Dolphins picked him up less than 24 hours after the Falcons released him, and he had stints in Indianapolis and Washington later that season—but he wasn't the same after the meniscus tear. "I was good straightaway, but left and right, it just wasn't there," he says. And while NFL teams will gamble on unheralded players with potential, or proven players with injuries, they won't invest in unheralded players with potential and injuries. With his mother doing better, Menendez went back to the Eagles the following season. On Reid's suggestion, he joined NFL Europe's Frankfurt Galaxy to get some work, but the attempted comeback quickly unraveled. Menendez knew he wasn't in football shape; he was sucking wind after only a few plays as a second-string receiver and return man. In Slow Getting Up, Nate Jackson's book about his football career, he details the moment he knew his football career was over: when his abused, worn-out hamstring gave way for the last time during a UFL team practice. Menendez's revelation was much less painful, at least physically. With a degree from EKU, his mother's health, and a bad taste in his mouth from his first two inauspicious seasons, Rondel Menendez left football. Menendez is at peace with how his football career turned out, and life has treated him well. He has a wife of 14 years ("been there from the beginning"), an eight-year-old son ("definitely very fast as well"), and a rental car business in Conyers, Ga., which he's owned for 10 years. He'd prefer to have been an NFL player, but hardly seems consumed by his past brush with glory—he just wonders about what could have been. "I think that's one of the main things that I do miss," he admits. "Being on the field. Doing the game. Doing the camps. Sweating and having fun and you know, just building a relationship with the guys. I miss that part, you know. I miss going out, performing on game day. I just love everything about the game of football. But family's good. Life is just good." And he'll have his claim to 4.24—at least until someone can run a 4.23. "When someone beats it, then I will officially be gone in history, you know," Menendez says. "As of right now, it's still going to be talked about because it's there. And, I mean, it always will be there until someone beats it."